When an individual seeks out financial advice, they want to know that their planner has more than just the expertise needed to help them with the numbers. They also want to know that they can be fully understood without being judged and that their advisor walks the talk and knows what it’s like to track and manage cash flow. Today’s guest understands that desire and believes in practicing what she preaches to her clients. Diane Dekanic is a professional fee-only financial planner who’s been in the business for twenty-five years. Diane is the president of Financial Health Management Inc. and has extensive experience dealing with clients in a range of financial circumstances, including expatriates and clients who have been downsized or are retiring. She’s also provided more than 8,000 workshops to date. For the rest of the episode, find the podcast on iTunes or Stitcher, or hit the link above. Many people don’t realize that managing cash flow is by far the most important part of financial planning. Without it, it’s easy to end up either in debt or living paycheque to paycheque with no room for error. Managing cash flow is especially crucial for many of the clients Diane has worked with over the years, like people in the midst of a career transition. In those cases, she’s not looking to help them invest for the long term. Instead, her goal is to help them understand how they can manage for a few months as they look for new work. With a dire lack of financial education in Canada and the rise of credit cards and electronic payments, Diane says, “people twenty dollar themselves to death or fifty dollar themselves to death” without having to think about ‒ or understanding ‒ how much they’re spending. For this reason, Diane describes herself as obsessed with cash flow and tough on people; that’s where she feels she can really offer value and give them hope. Sometimes this means showing clients that they’re on the right track, and other times it means giving them the exact steps they need to take to get where they need to be. Either way, she wants to show them that by managing their cash flow, they will be ok and they can eventually reach their financial goals. Diane doesn’t believe in a one-size-fits-all approach. Instead, she listens, comes to understand each client’s story, and gives them advice for their specific situation, sometimes flying in the face of the prescribed wisdom. One of the myths Diane debunks for her clients is the idea that home ownership is necessarily the best option for everyone. In fact, when it comes to people who don’t have a lot of money, home ownership can be one of the biggest obstacles in retirement. Even if a home is paid off, once property taxes, insurance, utilities, ongoing maintenance, and all other ongoing costs are accounted for, it can be a lot more economical for her clients to sell their homes, invest the money they make, and become renters. That way, they can make a profit off the money rather than having it sitting in a home and sucking up more money for the rest of their lives. Diane likes to show clients how their current scenario compares to renting, and they’re often shocked by the difference it can make ‒ especially when they’ve probably been told the opposite their entire lives. Hint: When it comes to demonstrating what a difference one change can make, Diane always tailors her approach to the client she’s working with. Watch your client’s body language ‒ are their eyes glazing over when you’re calculating something for them by hand? Show them a projection instead to make the numbers come to life. Or if projections aren’t their thing, maybe a spreadsheet will make more sense to them. Diane has a mantra that she will never ask her clients to do anything she hasn’t done. For example, she’s been tracking her own cash flow for twenty years, so when she asks her clients to do the same, she understands exactly what that entails. This also includes her own approach to managing cash flow. Like other advisors we’ve interviewed on the show, she doesn’t work on commission or take referral fees. Her clients are the only ones paying her, and that means they can trust her to be working for them alone. To keep her costs low, she actually works from her home in downtown Calgary, renting a boardroom in her condo whenever she has a client meeting. “When you’re fee-for-service, you only have so many hours in a day that you can bill, and so you really have to work at innovative ways to keep your costs down,” she explains. While some clients have found it strange to meet with their financial planner in a condo building ‒ it’s certainly a unique model ‒ they do respect it (and free guest parking in downtown Calgary certainly doesn’t hurt!). She sets a good example for them, and they appreciate that she keeps her costs manageable for herself and for them. Hint: To find more ideas for keeping your costs low, check out Episode 018: 3 Ways to Make a Fee-For-Service Model Effective, Scalable and Profitable with Shannon Lee Simmons. 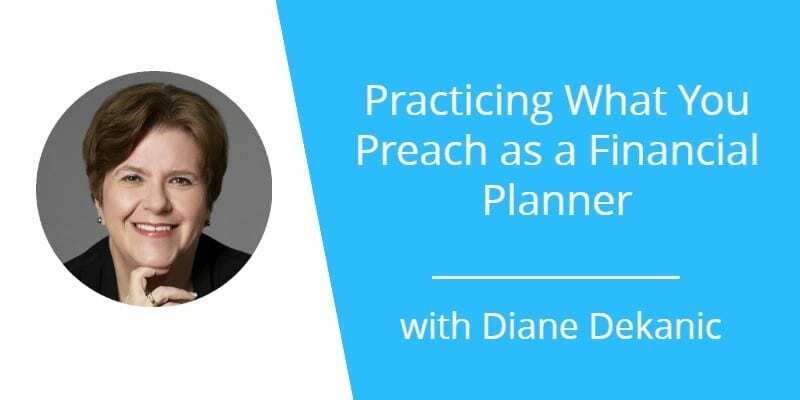 To hear more from Diane, including how she decided on her flat fee, why she often does follow-up appointments online, and more, listen to the full episode right here on this page. You can also find and subscribe to the show on iTunes or Stitcher, and sign up for our list below to get an email every time an episode airs.